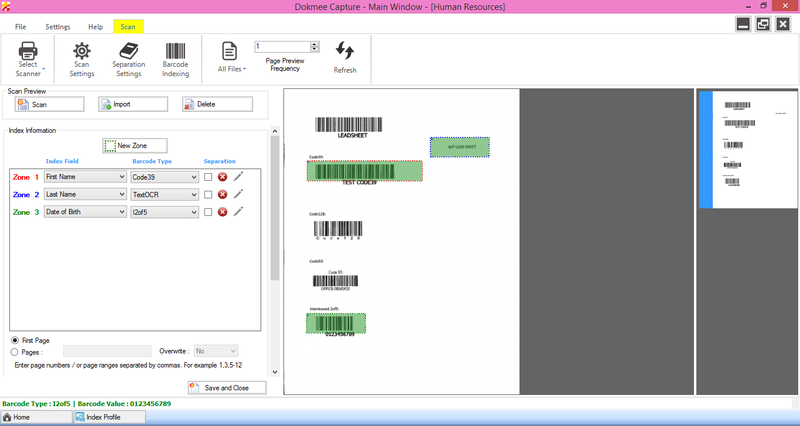 Dokmee Capture is a Document Capture Software. Improving business processes with no per click charges or limitations sounds almost too good to be true, but with Dokmee Capture it is a reality! Offering unlimited scanning, automated data capture options, and un-matched reporting and auditing tools, Dokmee Capture is the ideal Document Capture Software for scanning service bureaus, centralized scanning departments within large corporations, or companies looking to convert a large backlog of files. This is a state of the art solution for streamlining the conversion from paper to searchable electronic files in a manner that saves both time and money. Dokmee Capture Standalone Edition provides users with the ability to create an independent single station production environment for scanning, quality control, indexing, and exporting processes. You can certainly have multiple licenses on the same network, but each station will run independently and there will be no sharing of batches and workload. This solution is great for quick scanning projects at offsite locations or projects where a smaller team is involved. Dokmee Capture Network Edition provides users with the ability to separate the scanning, quality control, indexing, and exporting processes into independent tasks that can be performed simultaneously by different users, yet allowing batch sharing across multiple stations and centralized management of the entire process. It effectively transforms the scanning process into an assembly line that can be tailored to specific needs and carefully managed to maximize efficiency and minimize costs. Dokmee Capture provides the tools for efficient and accurate automated data extraction, which in turn leads to easy to find and retrieve electronic files. ​​Magic Index is a module that radically simplifies indexing. It gives users the ability to automatically index unstructured data while being accurate and cost efficient. Works with most TWAIN and ISIS driver scanners. Integration with image enhancement driver software such as Kofax VRS, Kodak Perfect Page, Visioneer Acuity, and Fujitsu PaperStream IP. Automatic import options for network devices and pre-scanned images that may require further processing. Import TIFF, PDF, JPEG, BMP files. Post scan image enhancement options such as despeckle, deskew, image crop, hole punch removal, border removal, and more. Editing tools and practical time saving shortcut options such as hot keys that are intuitive to use make the scanning and quality control process faster and more accurate than ever. Push images and data into any document management system or file sharing structure, along with automatic file naming and folder creation for quick and efficient organization and collaboration. Supported export image formats include TIFF, PDF, PDF/A, JPEG, GIF, BMP. Metadata may be exported as TXT, CSV, XML, and other customizable formats. Track the productivity and efficiency of users and processes. The built in reporting tool allows administrators to track and audit productivity and profitability automatically versus an alternative manual logging process. Input costs and revenue so that profitability reports are automatically generated. Reports can be generated by profile, batch, module, or user for specific periods of time. Save and send out to managers in Word, Excel, PDF, and SAP Crystal Reports format.